It's Friday! I know for many of you, it's the end of the week ready for the weekend! For me, well, it's vacation, so my days seem to be running into one another! I do hope you have some wonderful things planned! A few posts ago I posted a card with a stamp from Hambo Stamps using a Lawn Mower. I have another card I made using this image to share its you. I stamped the image multiple times using SU! River Rock and Creamy Caramel on the VV cs base. I used Kraft cs for my base and used the same to make the rosette. A button with some twine was placed in the center of the rosette and some additional twine used behind it. 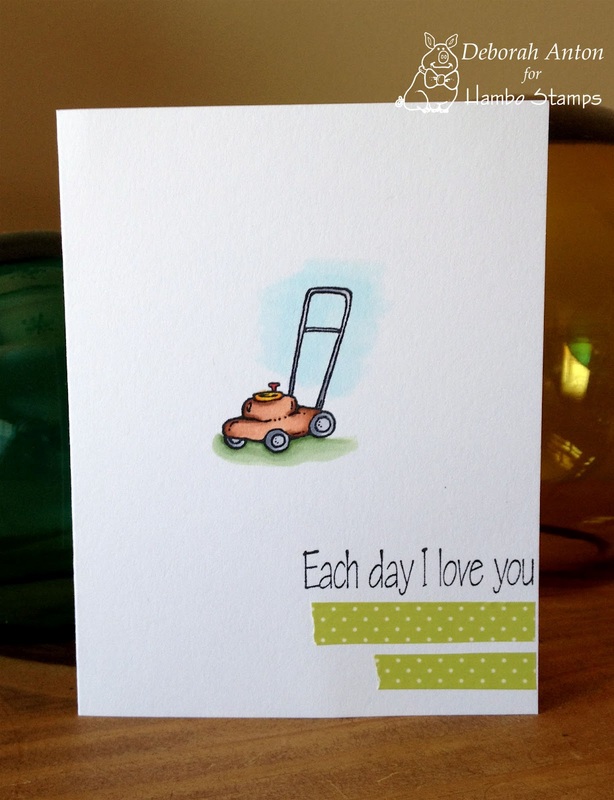 I finished the card off by using some fringe ribbon and popped up a portion of the sentiment with a cutout of the mower. 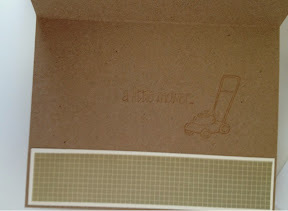 The inside photo, I apologize is not fantastic, but you will see how it is finished. I used Creamy Caramel which probably wasn't the best choice on Kraft, but it worked! :) I then used the remainder scrap of the dp on the bottom. Thanks for stopping by and giving a looksie! Have a fantastic weekend! The kids and I are ready to go and head out on our vacation! So with that said, I apologize that posts will be sporadic!! In the meantime, I hope you all head over to the Hambo Hoedown challenge and checkout the fun creations the Bacon Bits put together!! I hope you all have a fabulous beginning of Summer!! I hope you had a great weekend and having a good start to the week! I am unfortunately a little under the weather that started yesterday. I have gotten the rotten head cold and of course the timing couldn't be worse! We are flying Wednesday for vacation so you know if this doesn't get better, it will be an uncomfortable flight! So, I am taking it easy today as I did yesterday. The good thing is that I do feel about 50% better than yesterday so that is a good sign! 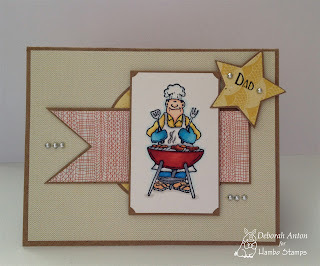 Today I want to share with you a card made with a stamp called BBQ Man from Hambo Stamps. I used an old Mojo Monday sketch from 2011for the layout. I colored in the image with Copics and used Basic Grey's collection of PB&J for the dp. The sentiment is also from Hambo called Well Grounded which was used on the inside with the exception of 'Dad' which I stamped on the star. 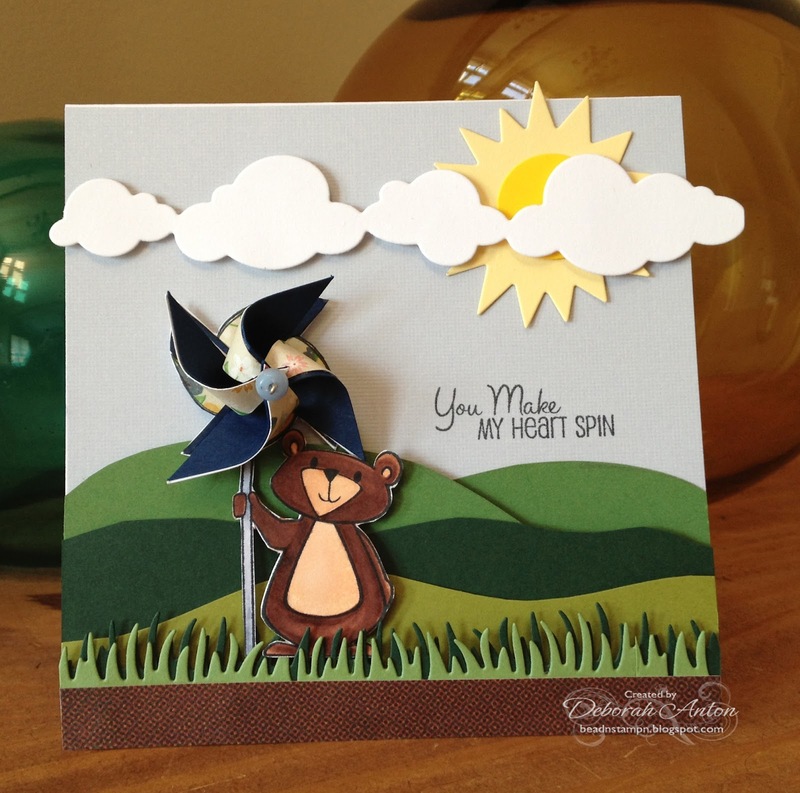 You Make My Heart Spin.. I used the TCP set What a Blast and had this scene in my head that I went with it. 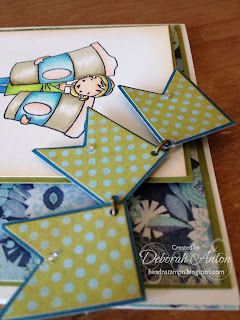 I created the pinwheel to match the stamped one and paper pieced the stamped pinwheel to match the one I made. 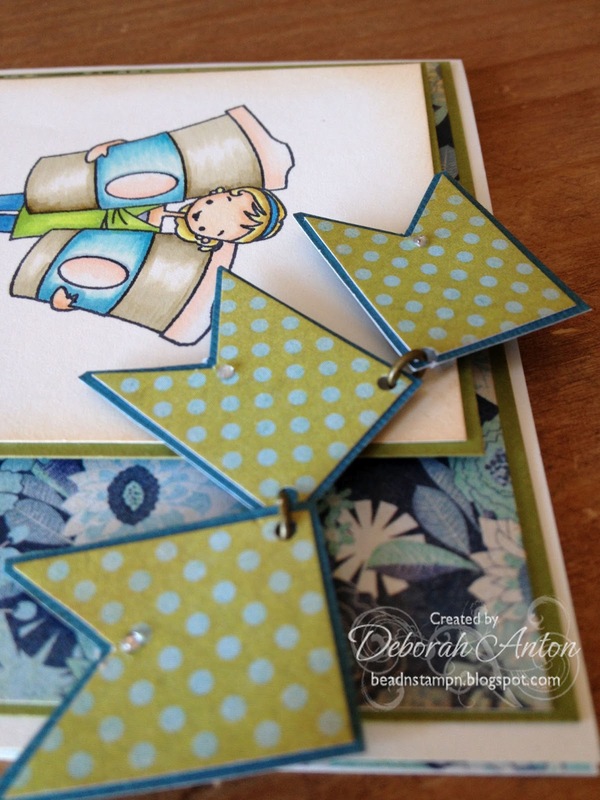 The pinwheel does work which makes for a little extra fun! 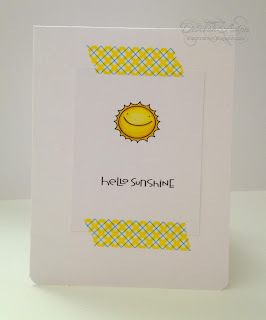 :) I used TCP cloud border die for the clouds and MFT's die-namics grass and sun. I colored in PJ with Copics and cut him out to popped up in the meadow. I am thinking a few flowers maybe wouldn't have hurt in here! I stamped the sentiment on the sky. All the pieces used were from my scrap collection! A few more pieces gone! Yay!! Thanks for stopping by!! Have a great weekend!! Hey everyone! The weekend is almost here and hopefully you all have some great plans ahead! For me, it's packing and getting ready for our vacation. Love vacations, but always a lot to do! And for the boys and I, it will consist of planes, no trains, and an automobile! I am tired thinking about it! lol! 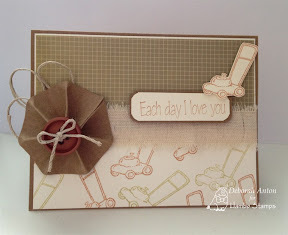 Today, I want to share a few card I made that I will submit to Paper Smooches for thier July Guest Designer call. If you are not familar with PS, you must check it out thier products! So fun and whimsical! You can even download some free images like I did to play and try them out! These little images are so much fun! I colored in the images with Copics and kept these cards clean and simple. I cut and popped up the owl, grapes, and flowers, while the sun and sentiment for Hoot had used some Washi Tape from Queen & CO and Bella Blvd. For the berries, I used MFT's Chevron dies to create the background and for thanks, the ribbon and cs are from my scraps stash. Thanks for stopping by and taking a peek! Have a great day! Black and white... a fabulous neutral combination! But coloring an image in shades of grey, black, and white can be a bit challenging! 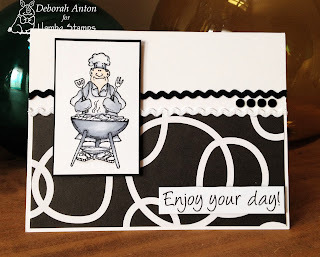 The digi team at Hambo Stamps have a fun challenge at the Hoedown today of creating in black and white! I used an image called BBQ Man and it took everything out of me to NOT color in some reds and other colors into it! He looks a little anemic.. LOL! The sentiment was taken from Hambo Stamps Digi of Catching Butterflies while the image was colored in using Copics in Cool greys and a hint of black. The dp is some I had from KEI and I finished it off with some black and white ric rack and some black metal dots. Be sure to stop by the Hoedown and see the creations the Bacon Bits have done! Have a great Wednesday! 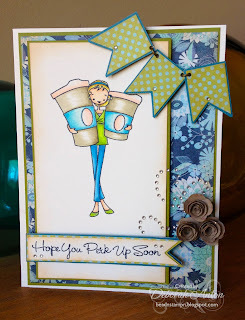 I wanted to share with you MFT's Get Sketchy July Guest DT Challenge and my creation. Here are all the details if you would like to join in! I'm defintely going to do another I think with this sketch as MFT has so many fun images that this sketch will work with!! Thanks so much for stopping by and taking a peek! Have a fab Monday! Hee hee.... I just get a kick out of this set! 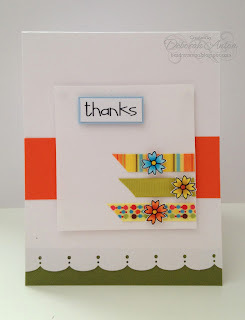 I made a card for TCP Tuesdays Color Challenge of Lemon, Berry, and Orange. You can find the details here and play along for your chance to win! 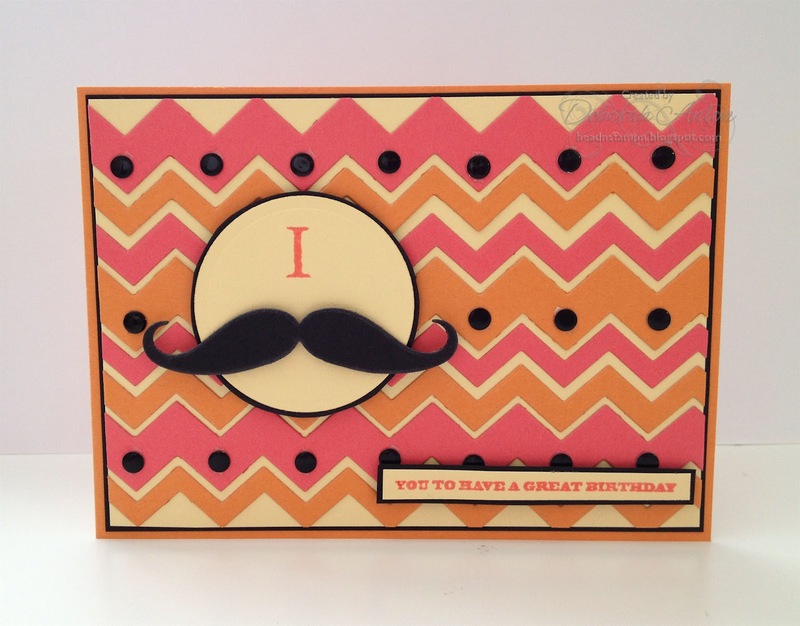 This was made using TCP's set of The Moustache Set and the coordinating die set for the center moustache. 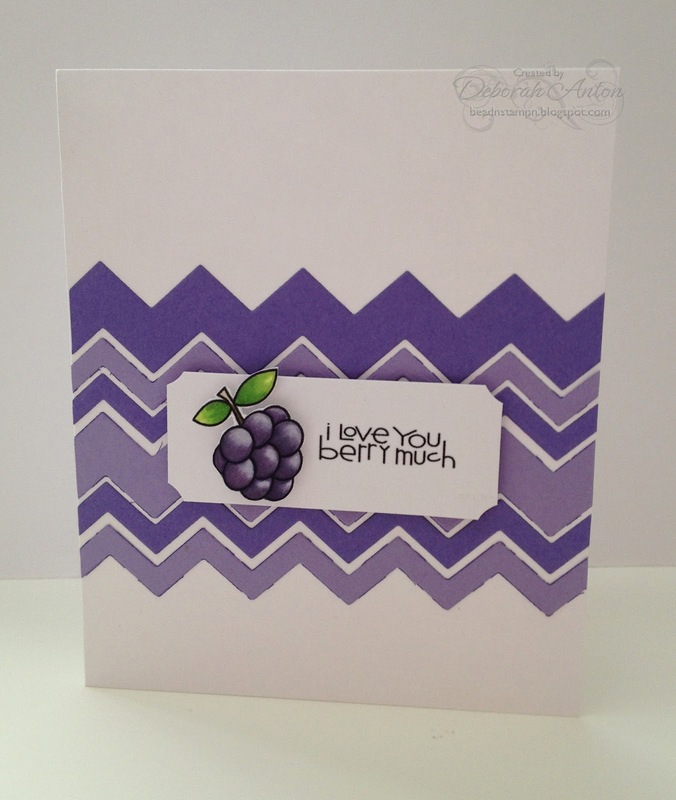 I used MFT's Chevron Die-Namics to create the background. 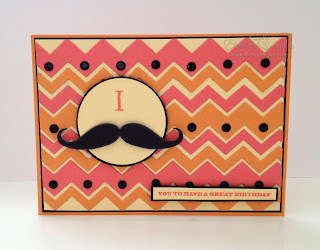 I finished the card by adding some metal dots and popping up the sentiment and 'stache! Yummy colors and super easy. Paper used was MFT's Orange Fizz, PTI's Berry Sorbet, and SU! BB. Thanks for taking a peek this gloomy Sunday! (Well it is here... rainy day in TN!) Have a great one! 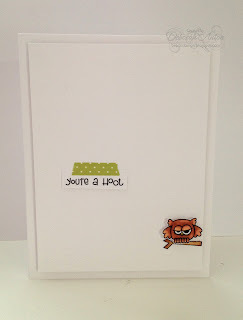 Today I want to share with you a card I made for The Cat's Pajamas TCP Tuesday. The techinque challenge was paper pleating which is always a fun! If you want to play along, click here for the details! 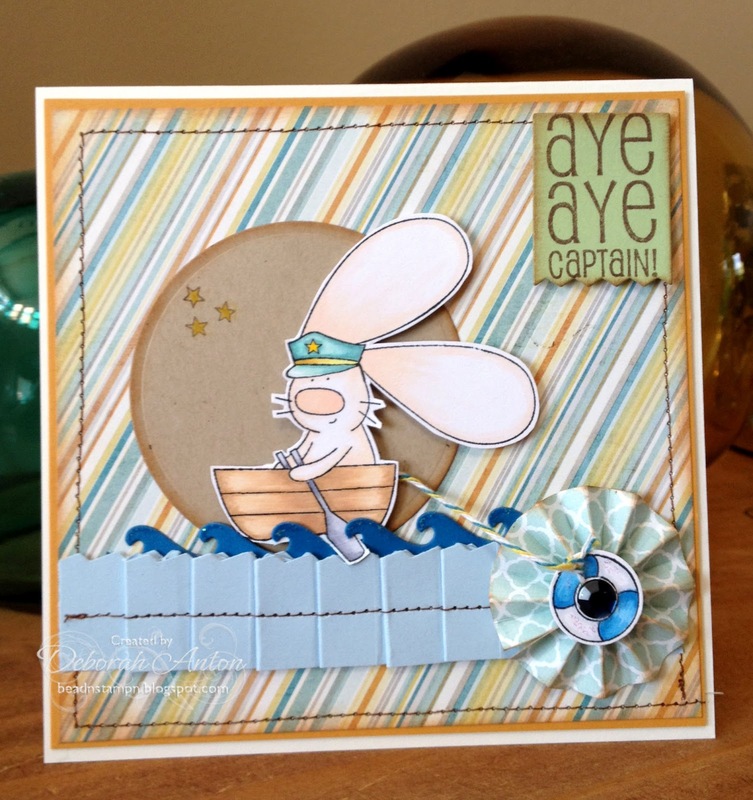 I used TCP's set of Aye Aye Captain which I colored in with Copics and cut out. The dp is MME while I paper pleated some scrap BB from SU! for the water. 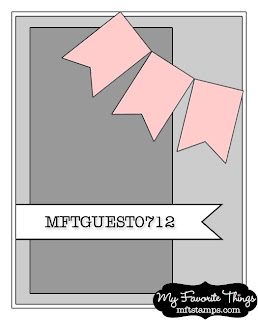 The wave cut out is MFT's Die namic wave as well as the mini banner on top is from MFT. I sewed around the edges with my sewing machine and created the rosette on my own. The rosette has a life ring from the stamp set that I added o n top with a rhinestone in the middle. That is connected with some twine from Queen and Co. attached to the boat. You can't really see it, but there are some stickles on the edges of the wave and life ring. BTW... that wave looks really blue in the picture! But I promise it matches really well IRL! lol!! Anybody up for a snorkel? This weeks Hambo Hoedown challenge features this cutie...Snorkle Boy! 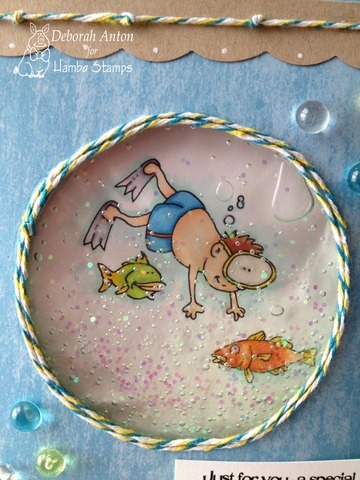 And the challenge to sparkle by using your choice of sparkly fun! I added some twine from Queen &Co bought from Lilly Belle's Paperie which I glued around the frame of the circle cut out. I used my decorative scissors for the strip at the top and added more twine. 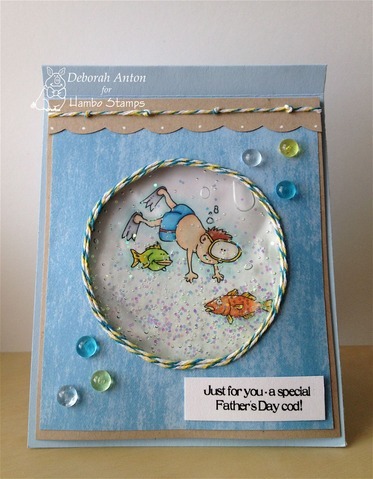 I finished off the card with the sentiment and some dew drops (remember those?) that I have had for eternity! 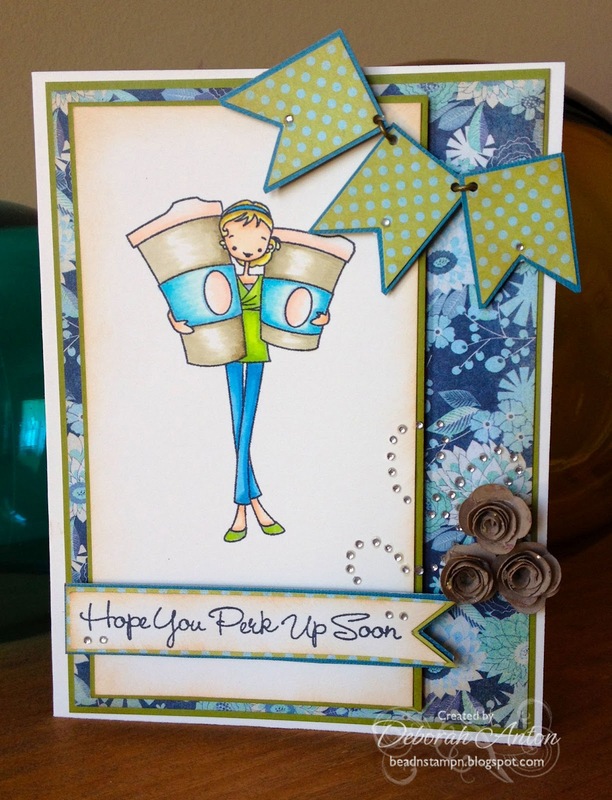 A fun card to make and your recipient most likely won't be able to stop squishing it! Lol! 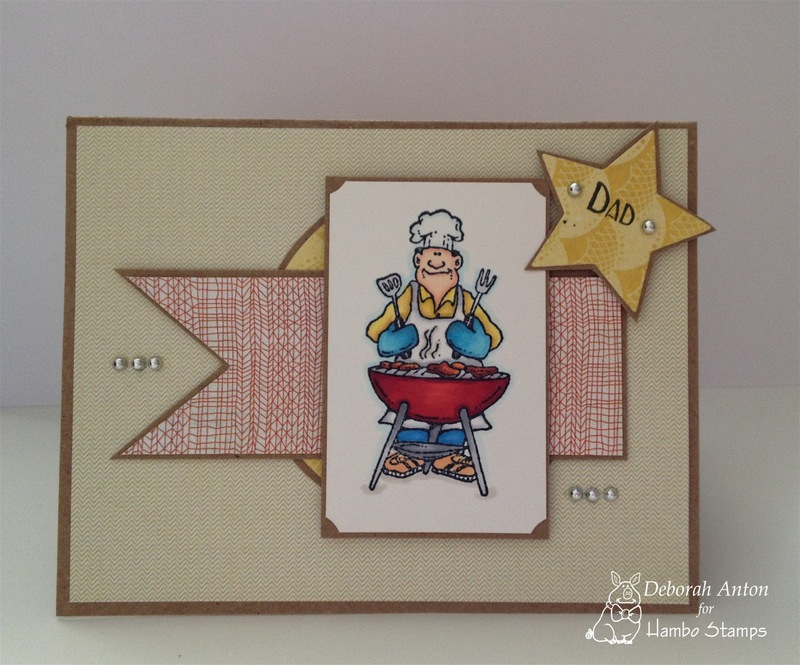 I thought my boys would ruin the card before I could show it! They loved playing with it! We hope you hop over to the Hoedown play along with us! We have a new group of Bacon Bits to show off so check out their awesome creations! Thanks for stopping by and taking a peek! Have a great Wednesday! I hope you all had a nice weekend! 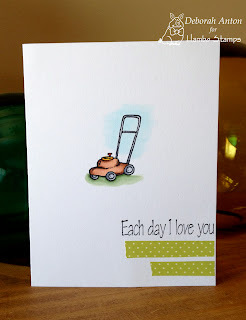 Today I want to share with you a simple and quick card. 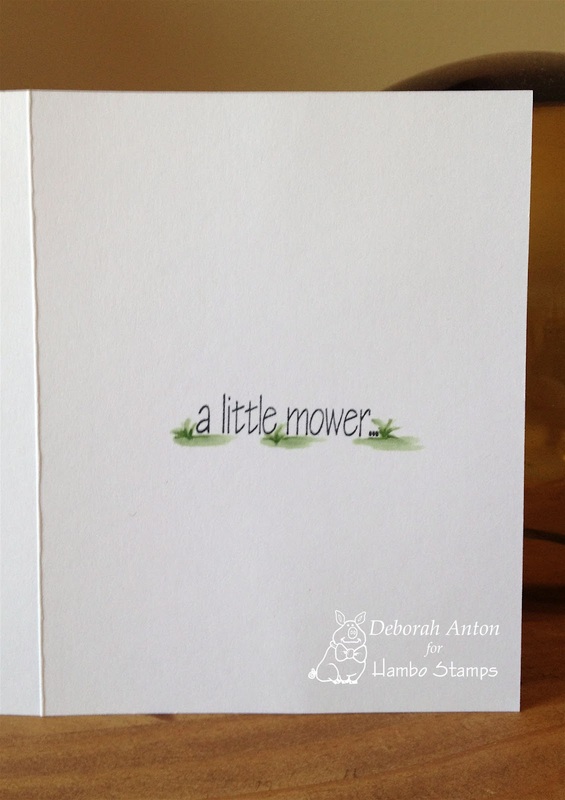 I used a stamp from Hambo Stamps, and when I saw it, I knew I wanted to make at least one, one layer card with it! See... pretty simple! 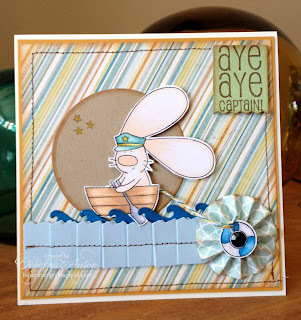 : ) Thanks so much for stopping by and taking a peek!! I hope you have a fabulous Monday!